KAMA Ayurveda Pure Rosewater is made from the roses of Kannauj, a region in North India, rich in white soil conductive to roses growth. The Kannauj rose is considered special, it has the same specifications as the Bulgarian rose.The steam water distillation process used to create this wonderful rosewater ensures a high level of hygiene and unmatched purity. Rose water is a natural astringent. It balances and restores skin's PH level and helps tighten pores.Rose water is also a good non-alcoholic toner. Kama rosewater is a good non-alcoholic refresher that helps remove the residue of the previous cleansing procedures such as removing of makeup. It refines the pores and tones the skin making it ready for moisturizing treatment. It can also be used to damp skin before applying Kama Natural Plant Mask (Lavanya) or Kama Miraculous Beauty Fluid (Kumkumadi). Explore the entire range of Toners & Mists available on Nykaa. 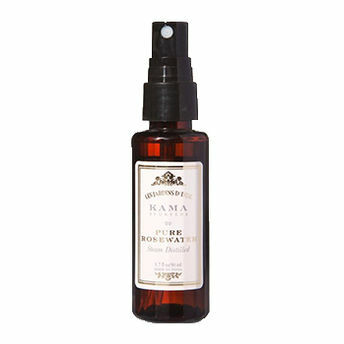 Shop more Kama Ayurveda products here.You can browse through the complete world of Kama Ayurveda Toners & Mists .Alternatively, you can also find many more products from the Kama Ayurveda Pure Rose Water range.